So sorry I am late with drawing 3 out of 4 of these contests! In my defense, I had seven new giveaways start in the past five days. I hope you are enjoying them and you are willing to forgive my tardiness. Out of 400 entries, the winner of the Monster Cable Lil' Jamz Headphones contest is . 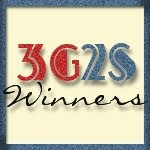 . .
Out of 530 entries, the winner of the Sassy Bath Prize Pack contest is . . .
Out of 222 entries, the winner of the "Twooth Timer" Toothbrush Timer contest is . . .
Out of 244 entries, the winner of the Fandangling Ceiling Fan Ornaments contest is . . .
Congratulations to our four winners! I will be sending out email notifications right away. Please respond within 48 hours to claim your prizes. I always respond to confirm that I've received your information. Thank you to everyone who takes the time to visit my blog.